Columbus and central Ohio are getting ready for the Fall season to begin! 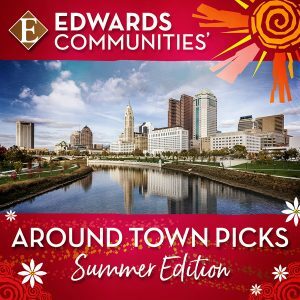 In September we have a unique mix of end-of-summer activities, combined with Buckeye football fever and festive events that put you in the spirit of the season. So whether you live in Columbus, are hosting a business event in the area, or are here visiting relatives, we invite you to sample all that our city has to offer! Our Columbus Clippers will be concluding their season over Labor Day weekend as they’ll be hosting the Toledo Mud Hens! Visit their website for more information and to purchase tickets! Nothing says Fall in Columbus like Ohio State Football! The Buckeye’s season is in full swing this month, with three home games taking place on September 1 against Oregon State, September 8 against Rutgers, and September 22 against Tulane! Even if you can’t snag tickets, there are plenty of places to tailgate in Columbus and cheer our Buckeyes to a win, including Edwards’ private club, The Barn! Go Bucks! The Columbus Crew, Ohio’s Major League soccer club, has home matches on September 1, 22, and 29 at MAPFRE Stadium. Check out their website for details and to purchase tickets. The 46thAnnual Columbus Greek Festival celebrates the culture and ancestry of Greece and the Orthodox Christian faith. Cathedral tours, music, dancing, shopping and Greek cuisine are just some of the fun activities offered at the festival. Learn more on their website. This year’s annual celebration is being held under three 100-year old covered pavilions rain or shine! Two stages and dance floors for entertainment and polkas, plenty of German food, beverages and kids activities will make this an event to remember! Enjoy live music, dancers, food and fun as you celebrate the heritage and culture of the Caribbean islands! Admission is free. Check out their website for festival times, parking and entertainment details! Now in its 13thyear, the Cat Caper 5K benefits the Cat Welfare Association. Leashed and friendly dogs are invited to attend along with their owners. For more information, please visit their website. Maroon 5, three-time Grammy award winning multiplatinum band, will be completing the final leg of their tour in Columbus! Their performance will feature their new studio album Red Pill Blues. Ticket information can be found on Nationwide Arena’s website. These are just a few of the fun events offered in September in our exciting city! You can learn about other events by visiting local websites such as Experience Columbus and Columbus Underground.